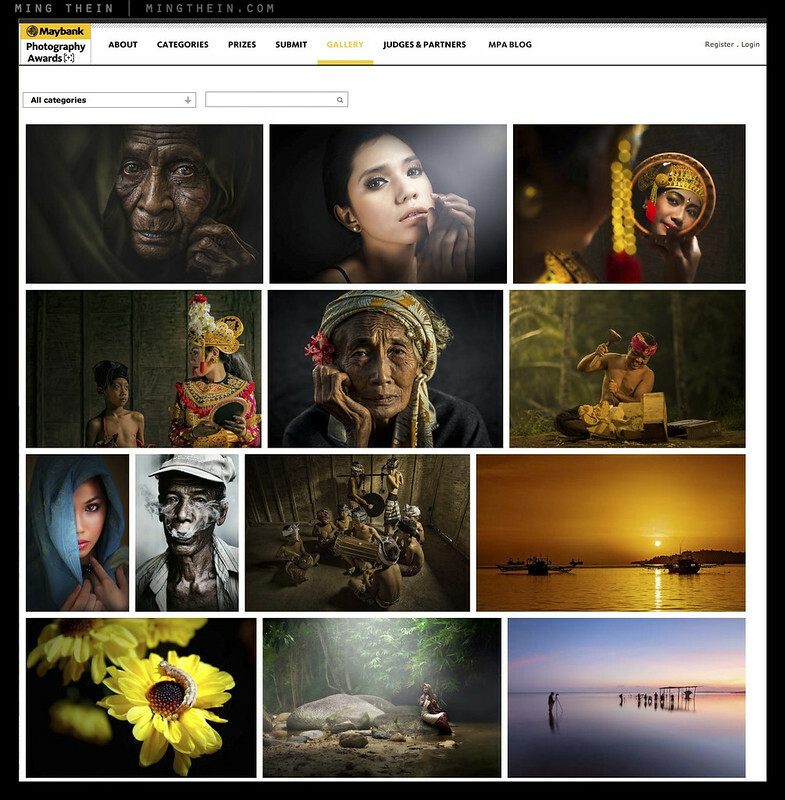 The 2013 Maybank Photo Awards are now open! You’ll probably have noticed the new banner on the right sidebar: following last year’s very successful Awards – nearly 20,000 entries and a couple of industry prizes for best campaign – Maybank are back again for 2013, this time bigger, better, and now open to all ASEAN residents – not just Malaysia, with the theme “Inspiring Asia”. Those of you who’ve been following the site since last year will know that I served as Head Judge for the inaugural contest; I’m pleased to announce I’m looking forward to resuming the role and working with them again this year. Not only are the prizes significantly larger – with a total pool of USD35,000 – the final judging panel has also gone up a notch: joining me are Michael Yamashita of National Geographic; Raghu Rai of Magnum; Jim Liaw (MPA UK fellow) and Manny Librodo. I’m honoured to be in such distinguished company – let alone retain my role as Head Judge. We’ve also got some new partners – Maybank is of course the title sponsor again; Leica remains; Canon, Adobe, Schmidt and The Center For Asian Photographers are new for this year. The competition opened for submissions on 1 August, and will run until 31 October 2013; even in the first few days, looking at the entries that have been shortlisted, I’m sure we’re going to have an even more difficult time picking winners this year – the standard is very, very high indeed. I think it’s probably good to say a few words about the judging process at this point. In the interests of objectivity, all judging is done blind; submissions make a general pool which is filtered by the first level of shortlisting judges; these judges view multiple images and an image must have average a certain rating level across all who view it in order to be shortlisted. There are no names attached to the images at this point, of course – but the information is stored securely in the system. These images are the ones which will be visible during the course of the competition on the site gallery. At the competition close, another round of shortlisting takes place, with the intention of getting the final judges’ viewing numbers down to about 2000 or less images per category – that’s still a hefty number to deliberate over seriously. Each category judge will then shortlist their 10-20 picks in their own category, and the final judging for places and the winner takes place as a discussion between the head judge and the category judges. The head judge views all shortlisted images in all categories, and Photographer of The Year is shortlisted from the pool of all finalists, and collectively discussed. The winner must be a finalist in at least two categories, or winner of one; it’s vital to demonstrate a range of photographic talent across multiple subjects and disciplines in order to distinguish yourself from the competition; these are the qualities we’re looking for in the top dog. You simply cannot be a good photographer if you are one-dimensional – the creative element of photography stems from the ability to see and execute the unusual; how can you do that if you’ve only seen things from one perspective? If it sounds like a somewhat labyrinthine process, we have a couple of challenges: firstly, the sheer volume of entries; secondly, maintaining objectivity. So as not to give the presentation medium an advantage, shortlisting is done with identical sized images by multiple people with different levels of expertise; the finalists and winners are evaluated using physical prints made by the same lab for all judges to eliminate any possible variations in viewing media. Only after the winners and finalists are selected are the names revealed – we then perform a due diligence check to ensure that the winners are the rightful holders of the rights to their images, and that there aren’t any other active licenses precluding their use. The judging panel is composed of seasoned professionals: we take IP rights very seriously. This is one of the few competitions where image rights of the winner not not transfer to the competition host – we retain the right for use in the event that you are shortlisted, finalized or win, but that’s all. It’s the sort of competition that I would want to enter – if I wasn’t judging – I know, because I wrote the rules specifically to protect the rights of the photographer to encourage participation by individuals of all calibers. Speaking of reasons to enter – let’s take a look at the categories and prizes. Remember, this year’s theme is Inspiring Asia – the competition is now open to all ASEAN residents. « Now available: the first two videos in the workshop series! what size is required and what adjustments are allowed? Please check the detailed T&C on the competition page for the technical details. A reasonable amount of adjustments and processing are allowed that do not change the content of the image, i.e. composites etc. are not allowed. A group of representatives from the partner companies. I don’t know who the individuals are specifically. I am an ASEAN resident. But not an ASEAN national. I’ll try a submission and see what happens. No I won’t! Japan not even close to an ASEAN member state… Don’t know why I got it into my head that they were. Time to book that appointment with a neurologist I think. Shame, because that looks like a really good competition. Best of luck to the guys from here that try: envious! L’ha ribloggato su ChristianFresco's Blog.